Apart from mid-range and luxurious beauty bundles, beauty trial kits always, always win over my judgement. 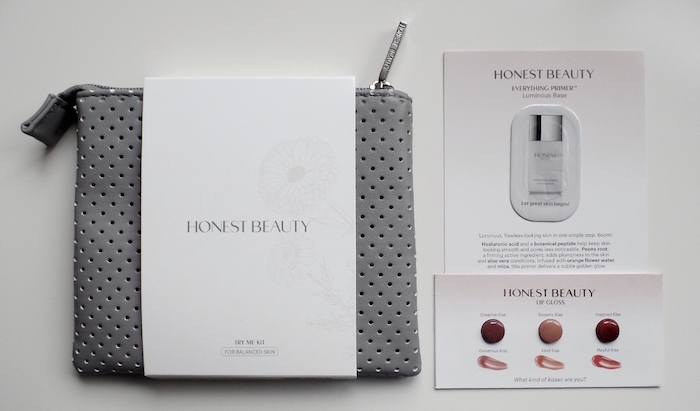 Honest Beauty (yes, by Jessica Alba's The Honest Company) has been pretty aggressive with their marketing and even offering free trial kits for US (Alaska and Hawaii included) fans. The catch that's causing some beauty mavens to raise their eyebrows? You have to 1) pay $5.95 to ship out your trial kit and 2) you only have 7 days after receiving your trial kit to cancel (for any reason) before you are automatically enrolled into their monthly beauty bundle (of your choice) for $50. While the shipping fee is fair, I believe 7 days is a little to quick to evaluate if a skin care regimen is good for you. At the very least, I give myself 2 weeks. Still, not wanting to be surprised, I made a note to call their customer service to cancel if I break out or feel any burn. Anyway, hesitations aside, I ordered a balanced skin free trial kit. I got mine 5 business days from the date of order. Refreshingly Clean Gel Cleanser contains chamomile and calendula help to calm and soothe. Yucca root extract and saponaria provide a fresh and foamy experience to remove dirt and makeup without any harsh ingredients that can strip or over-dry skin. Now that’s refreshing. This daily face moisturizer contains chamomile and calendula to help calm and soothe. Vitamin C rich acerola cherry, barbary fig and green tea provide antioxidant support to help balance skin tone. Licorice extract has been shown to fight and improve the appearance of dark spots. Be your own guiding light. The Beyond Protected Daily Beauty Fluid contains chamomile, calendula and aloe help to calm and soothe. Hyaluronic Acid attracts moisture, locking in hydration. Non-nano zinc oxide, mineral broad spectrum sunscreen protects against damaging UVA and UVB rays to help prevent signs of premature skin aging. We’ve got you covered. As a beauty blogger nearing a decade and a half road testing cleansers left and right, I have to give it to the Refreshingly Clean Gel Cleanser. It's a great addition to my daily luxe routine. It smells wonderful, refreshing without any tingling sensation, can remove waterproof foundation and mascara, and non-drying. 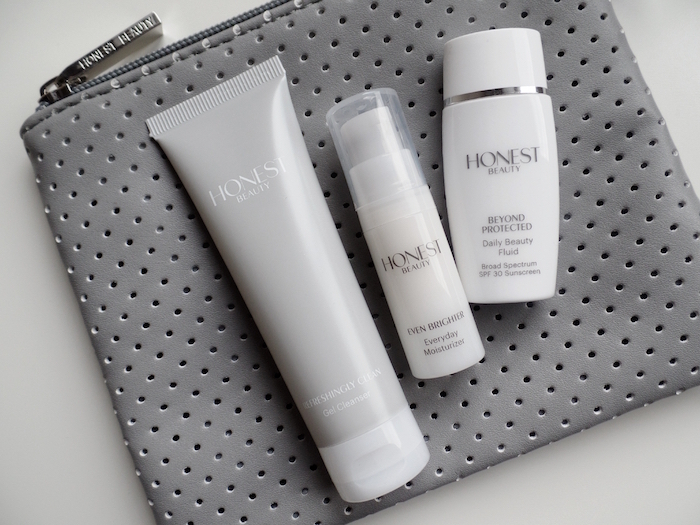 Honest Beauty promises that it's made free of SLS, SLES, sulfates, parabens, formaldehyde carriers, PEGs, MCI/MI, steareth-n, synthetic fragrances, or dyes. I like this cleanser a lot and it's definitely on top of my shopping list as soon as I finish my current cleanser. Until I stopped my hormonal imbalance meds three months ago (I need a new prescription here in the US since my PH brand isn't available here), my skin's been good. I'm trying to be as careful as possible with my skin care and makeup routine since I'm so prone to breakouts and rashes (more about this in a later post) right now and I don't want to agitate my skin. I got exited with the Even Brighter Everyday Moisturizer since similar to the Refreshingly Clean Gel Cleanser, it was concocted without the shady stuff -- parabens, paraffins, formaldehyde carriers,PEGs, steareth‐n, propylene glycol, butylene glycol, petrolatum, mineral oil, synthetic fragrances, or dyes. Trying it out twice a day for 7 days, I found it to be moisturizing but nothing spectacular beyond that. Like a real good girl, I use my sunscreen rain or shine. The Beyond Protected Daily Beauty Fluid is a no-frills sunscreen for daily use with a hint of moisture. I use this when I jog very early in the morning the sun just burst. Sunrise here in Texas is pretty wild (and burning!) so if I wake up late or workout late in the day, I swap this with a sport-type sunscreen for extra coverage. Overall, apart from the cleanser which I liked, I'm not sold to the trio hence canceled my bundle. 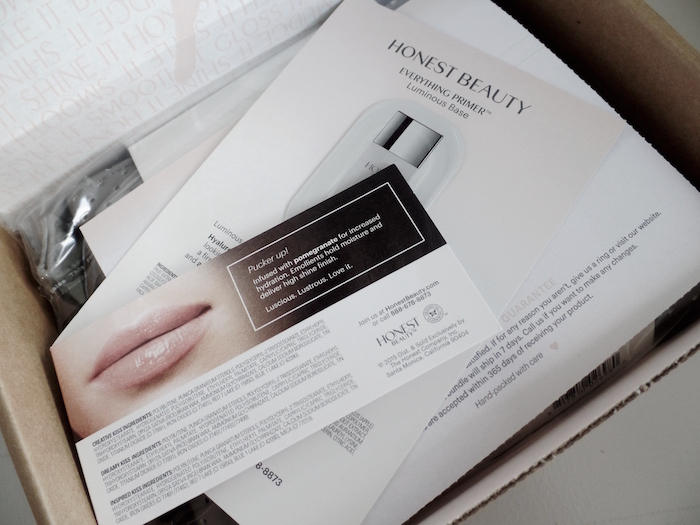 I heard the Honest Beauty Magic Balm is far more promising; can't wait to check that out at ULTA.